For a show people have written off as “it used to be better” for over two decades, The Simpsons still inspires a fiercely loyal fanbase. It’s inspired recipes, countless memes, and an absurd number of tattoos. 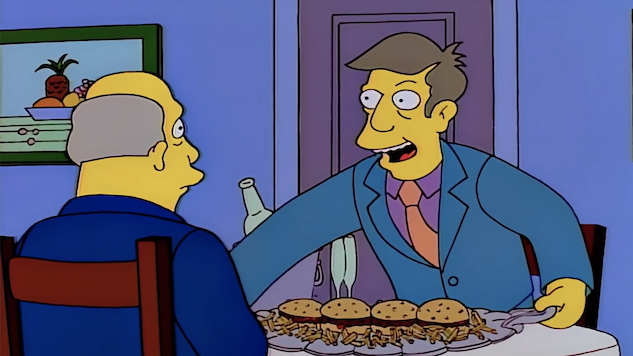 But one moment, in particular, stands out as a point of inspiration for fans: the “Steamed Hams” segment from the 1996 episode “22 Short Films About Springfield.” Over the years this classic bit, which sees Principal Skinner flummoxed while preparing lunch for Superintendent Chalmers, has been the source of a steady stream of parodies and mashups, from piano accompaniments to a brutal takedown of Jordan Peterson. But a new contender to the “Steamed Hams” throne has approached, a mashup of the original animation and a musical remix that turned the bit into a cover of Green Day’s hit single “Basket Case.” Created by YouTuber Juliana Egg, utilizing piratecovejoe’s mashup, “Steamed Hams but it’s Basket Case by Green Day” is a heartwarming punk rock abomination. The Simpsons might have been better 20 years ago, but thanks to creative millennial content creators, it will forever have a place in our meme soaked culture.